If you are as into beauty products as I am, then you have probably heard of a certain pink egg shaped beauty sponge and its apparent wonders for applying cosmetics. But you may not have heard of its face washing, biodegradable, affordable cousin made from Konjac fibers. In Japan, Konjac has been used as a medicinal food since the sixth century meaning people have been eating it for over 1500 years! Apparently Konjac or Konnyaku has nearly zero calories is very high in fiber and is sold as a very low cal noodle, shirataki. 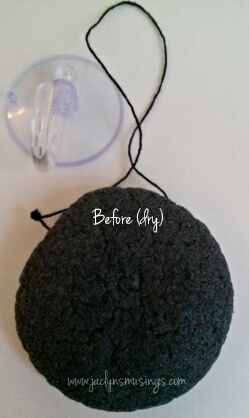 MY Konjac Bamboo Charcoal sponge is a large tear drop shaped sponge. It is very hard when first taken out of the package, but softens considerably as it swells with water. And can be sanitized microwaving in a bowl of water for 1:30. What makes these sponges unique is that because they are made with 100% natural ingredients, these sponges can be thrown in a compost bin once one finishes using it. Each sponge will last anywhere from 2-4 months on average although exact length of time varies depending on amount of use and whether it is used alone or with face wash.
I’ve tried using this alone, with non-exfoliating (ie “gentle”) face wash, and exfoliating face wash. I have to say that I prefer to use this with non-exfoliating face wash. I find the ‘beads’ or ‘roughage’ in exfoliating face wash to get stuck in the sponge and be too harsh. And while I get a fairly good clean when using this by itself, my preference is to use a gentle face wash. I find that, that is the perfect harmony between getting a deep and not a too harsh clean. I do not use this to remove my makeup. I prefer to use makeup removing facial wipes to face wash for removing makeup. I use this first thing in the morning as the start to my beauty routine. I love the idea of sponge that can essentially be buried in the backyard and will easily degrade back into the soil. So if you are looking for a 100% all natural** facial cleansing sponge that works great, doesn’t require the use of face wash, and is quite reasonably priced then go check out MY Konjac Bamboo Charcoal Sponge (click HERE to purchase on Amazon). Do you or have you used a Konjac sponge before? What do you use when you wash your face (ie a washcloth, your hands, special facial cleansing mitt, etc)? I’d LOVE to hear about your skincare regime in the comments before! 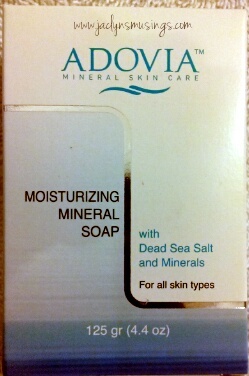 I recently had the opportunity to try two more awesome products by Adovia Mineral Skin Care, Facial Lift & Firm Serum with Dead Sea Minerals (click HERE to find on Amazon) and Dead Sea Salt Soap (find on Amazon by clicking HERE). 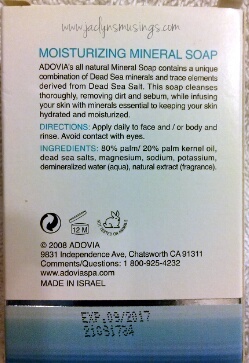 All Adovia products are made in Israel. Whenever possible, I prefer to purchase products made in Israel. Dead Sea Minerals are long believed to hold beneficial and/or healing properties. Salt (and sugar) scrubs are a fabulous way to exfoliate your skin without using harsh chemicals. Adovia’s Dead Sea Salt soap is using salt as a gentle and natural way to slough off dead skin cells revitalizing your skin. I personally LOVE using sugar scrubs to exfoliate my lips prior to applying lipstick (especially matte lipsticks). I truly have enjoyed using this Dead Sea Salt Soap. I’m fairly picky when it comes to bars of soap that I’ll use on my body as I once had a doctor tell me that using Ivory was contributing to my itchy skin. He recommended that I ONLY use Dove which is milder and much more moisturizing. Amazingly this soap didn’t irritate my skin either. I like to exfoliate before shaving (my legs) as I’ve heard it helps to achieve a closer shave. I also like the how soft and supple frequent exfoliating leaves my skin. 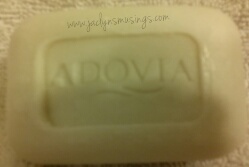 So if you are looking for a relatively inexpensive exfoliating bar of soap then I highly recommend that you check out Adovia’s Dead Sea Salt Soap which you can easily find on Amazon by clicking HERE. 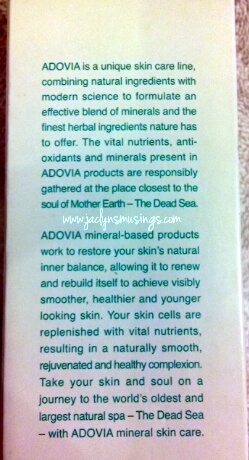 I also had the chance to try Adovia’s Facial Lift & Firm Serum with Dead Sea Minerals & Vitamin C. I love serums! Vitamin C is commonly thought to help aging skin when applied topically. In fact all the serums I’ve tried in recent months have contained a fair amount of Vitamin C.
I love the feel of this serum as I apply it. And the lovely glass bottle looks nice on my counter as well. I also really like that this serum has a pump dispenser as opposed to a dropper. I find that pump dispensers are a lot less messy although a dropper is helpful when the serum is very liquidy. This serum is much thicker and creamier in consistency than the other serums I’ve tried. You may prefer a thinner consistency as it all just personal preference. Positive effects from changes in skincare routine do not happen overnight. I’m not sure if I can tell if I’ve had any changes in the minimal amount of wrinkles/fine lines that I do have. What I have noticed is that my skin is much less dry than what is usual for me. Typically I’m prone to very dry skin and will have dry patches if I don’t exfoliate before applying makeup. Lately, I haven’t needed to scrub my face as carefully as my skin seems to be ‘naturally’ less dry. I do still apply some kind of moisturizer before applying foundation, but forgot a couple times and still had a flawless makeup application. 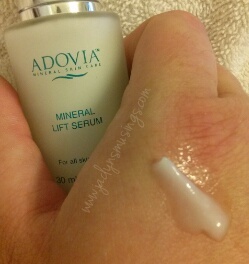 If you are looking for a creamy serum with anti-aging properties that promotes hydrated (not oily or greasy) skin, then you may want to check out Adovia’s Firm & Lift Serum with Dead Sea Minerals & Vitamin C which you can find on Amazon by clicking HERE. Do you have a favorite bar soap or serum? I’d love to hear all about it in the comments below! 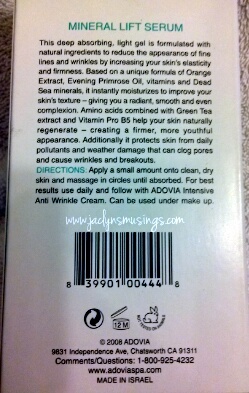 **Disclaimer: I received one or more of the products mentioned above for free using Tomoson.com. Regardless, I only recommend products or services I use personally and believe will be good for my readers. Have you ever tried to get a good nights sleep away from home but couldn’t because of too much light or noise? I know I have, especially when I spent weeks or months at a time in the hospital. At one relatively recently renovated hospital the so called window coverings didn’t keep out any light at all! Depending on which side of the hospital I would be woken up by the intensly bright light at dawn or blinded at dusk. I had to resort ot sleeping with a face mask, but it wasn’t all that comfortable. And many times I’d resort to sleeping with ear plugs so that all the constant beeps and interuptions wouldn’t disrupt my sleep even more than it already had. When I had the chance to apply for this campaign specifically for a ‘comfortable’ sleep mask that had extra space for eyes (and eye makeup) I eagerly applied. 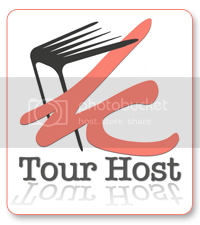 [Click HERE to purchase on Amazon] See I’m doing quite a bit of traveling this summer! In fact I’ll be flying from California to the East Coast then down to Florida before flying back to California. 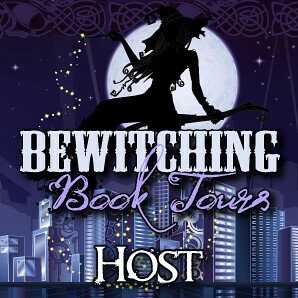 I’ll also be taking a 3.5 hour bus ride between East Coast locations. So I’m hoping that this set of the most comfortable eye mask I’ve ever tried along with a pair of ear plugs and a cute little bag to put them in will help me get some shut eye during my red eye across the country. I was very impressed with the design of the sleep mask. The elastic band on the mask is adjustable with a velcro clousure so as to further customize the fit than elastic alone. And the mask part alone is quite different than any of my previous masks that were basically just a flat eye shapped cut out on elastic. This one has like ‘cups’ so as to allow your eyes to open and close without rubbing against the fabric. It is also considerate of those of us, like myself, that may be wearing eye makeup inlcuding mascara! I really do love the way it fits, and like the name says, this sleep mask truly IS comfortable. And it blocks out light very very well, which some of my previous masks didn’t do so a great job with. If you are someone, like myself, that is prone to migraines especially light sensitive ones or someone who travels a lot, or just prefers to have total darkness for sleeping then I highly recommend you check out this super Comfortable Sleep Mask. And I love that it also includes a pair of ear plugs and a handy carrying case. Natural Revolution’s Comfortable Sleep Mask, Ear Plugs, and Carry Case case be easily purchased on Amazon by clicking HERE. Have you had any experience with needing a sleep mask or ear plugs to get a good nights rest? What do you use to wash your face? 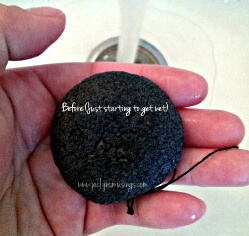 Do you use a wash cloth, exfoliating mitt, sponge, your hands? And do you use any sort of cleanser or just water? I typically use an exfoliating mitt that I got about two years ago that can be used to remove makeup either in conjunction with any cleanser or with plain tap water. While I have tried the latter, I usually did the former and use cleanser. Well, my face washing routine got a bit of a shakeup when I had the opportunity to try Konjac Facial Sponge (click HERE to find on Amazon) which like my mitt can be used with or without cleanser! 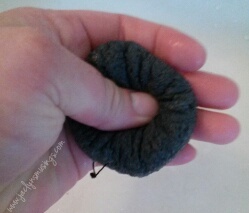 This nifty little sponge made with only TWO ingredients, konjac root fiber and bamboo charcoal and cleverly comes with a little suction hook so as to be able to easily hang it up to air dry in between uses with the sponge itself having a string running through it giving it something to hang from. As it dries the sponge shrinks back down close to the compact state it originally came in. The first time I used it, it took the longest for the sponge to fully fluff up as it began to retain water. I really like the texture of this sponge as it fluffs up with water. 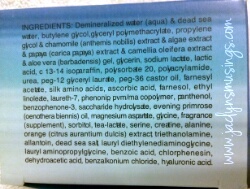 While it can remove makeup with water alone, I prefer to use a face wash in conjunction. Because I have chronically dry skin, I find that I must exfoliate every time before I can apply makeup. I find that I can use my more ‘gentle’ face wash with this facial sponge and still receive an excellent deep clean. Apparently in Japanese beauty routines, konjac root has been used for well over a thousand years as a great way to exfoiliate delicate and sensitive skin. Boscia sells a Konjac Cleansing Sponge on Sephora.com for $18 (which is almost double the price, yet still must be replaced every 2-3 months) and that version doesn’t contain all natural bamboo charcoal. 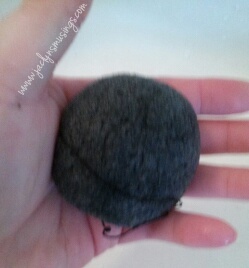 Konjac Facial Sponge can be used for about 2-3 months before needing to be replaced. I love that once I’m done using this sponge that it is 100% biodegradable! At only $10, Konjac Facial Sponge costs about $3.33 to $5 per month making this semi-disposable sponge quite affordable. If you are looking for an affordable, yet still high quality product to complement your face washing routine, you should definitely consider trying purSOL Konjac Facial Sponge which can conviently be purcahsed on Amazon by clicking HERE. What/ If anything face washing routine do you follow? Please share in the comments! **Disclaimer: I received one or more of the products mentioned above for free using Tomoson.com. Regardless, I only recommend products or services I use personally and believe will be good for my readers. Regardless, I only recommend products or services I use personally and believe will be good for my readers. Please see my disclaimer policy for more information.